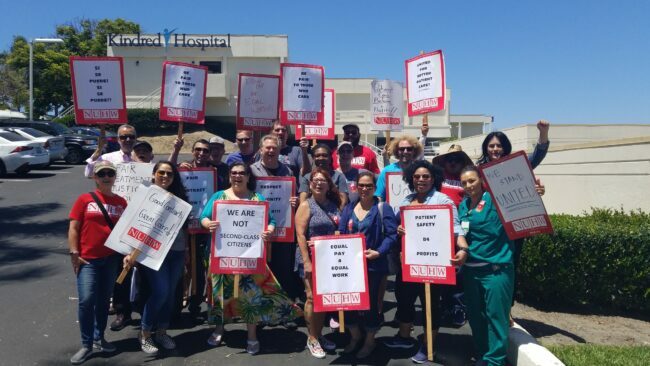 One day after voting to authorize a strike, caregivers at Kindred San Diego struck a deal for a contract that will increase wages between 9 and 24 percent over the next three years. The nearly unanimous strike authorization vote in July capped a powerful 10-month campaign to win a first-time contract for 140 caregivers that should help reduce turnover at the 70-bed long-term care facility. The unit, which includes nursing assistants, respiratory therapists, licensed vocational nurses, cooks and housekeepers voted 99 percent to join NUHW in June 2017. They stuck together during 17 bargaining sessions, staged a successful picket and then voted 99 percent authorize a strike. Their unity paid dividends. After the strike vote, Kindred made significant concessions that resulted in the contract agreement. In addition to raises, the contract includes a ban on subcontracting, a grievance procedure to enhance job security and a clause that protects workers and their contract if the hospital is sold. For workers who had previously never seen annual raises top 2 percent, the contract was a testament to their strength as a union. Ninety-nine percent voted to ratify the agreement.